The Original 70mm engagements Of "Close Encounters Of The Third Kind"
What follows is a list of the known 70mm engagements of the movie "Close Encounters of the Third Kind". As one can glean from the list, 70mm engagements were aplenty on this title, with many "out-of-the-way" places often playing the movie in 70mm. The Original 70mm engagements Of "Alien"
If released today, Ridley Scott's “Alien” would have opened on several thousand cinema screens across the country. Back on Memorial Day weekend of 1979 when the film was originally released, however, there were fewer than 100 engagements, 91 select-market engagements to be exact. By Bill Cobbs First review of "The Cinerama Adventure"
All known 70mm Six-Track Dolby Stereo engagements of the movie "Star Wars". Standard 35mm engagements. which the film was also released in, are not included. Riding back to Manhattan alone with a captive David Lean in a thirty minute taxi ride, I had questions of a lifetime to ask him. I never got to ask one. He was so excited and had so many questions he wanted answers to. The sharpness and resolution of the D-150 lenses is amply demonstrated in the prologue. There are screen-filling close-ups of Patton's pistols, his decorations, his West Point ring. The clarity of detail, despite the magnification, is amazing.of detail, despite the magnification, is amazing. 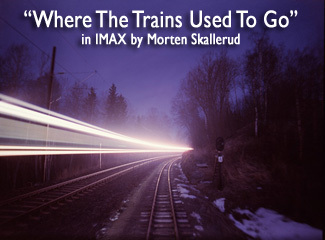 • Go to Making of "Where The Trains Used To Go" "Where the Trains Used to Go"
I love trains. I love Large Format, and I love making magic on film. "Where the Trains used to go" gave me an opportunity to combine the three for a 4½ minute 15perf 70mm "magic journey" along the remains of a closed-down narrow-gauge railway. With cutting edge technology for home cinema, audiences still prefer a huge 15 meter screen and the social experience of being with other people in a cinema, so cinemas theatres will continue to exist. KINOPANORAMA was developed between 1956 and 1957 by film technicians in Moscow at the USSR Cinema and Photo Research Institute. About "Chastity Truth and Kinopanorama"
Some six minutes were shot around the City of Moscow of Kremlin, Red Square, and the facade of the world famous Bolshoi Theatre.